Now, Jaguar has thrown its hat into the ‘lap record that’s not at the ‘Ring’ erm…ring. 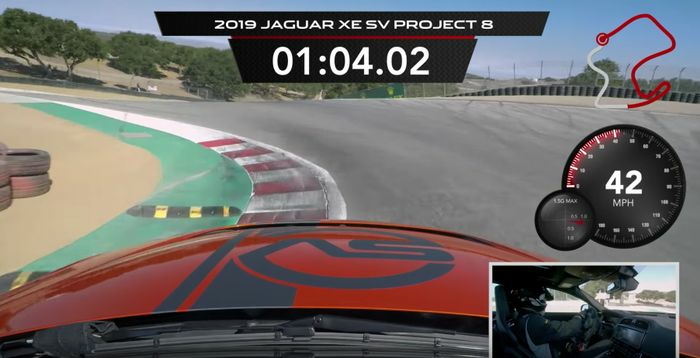 Having already nabbed the EV record at Laguna Seca with the I-Pace (since beaten by the yet-to-be-released ‘Lucid Air’), Jaguar came back to the Californian circuit with the shouty XE SV Project 8 all-wheel drive track weapon. The magic time was a 1:37.54, almost a second quicker than the previous fastest four-door, the Cadillac CTS-V. Alfa Romeo’s Giulia Quadrifoglio is now in second place with its 1:39.65, while the BMW M5 - which is also all-wheel drive and has exactly the same power output as the Jag - is a tenth and a half of a second further back. Despite being limited to 300 units Project 8 hasn’t sold out just yet, so perhaps the Seca lap is a gentle reminder to lovers of exclusive and fast things that the £149,995 weapon is still very much available. It shares precious little with the standard XE - to give you an idea of just how bespoke the vehicle is, it’s worth pointing out that JLR’s Special Vehicle Operations bods even had to move the headlights to accommodate the fat 265-section front tyres. It’s likely to be the last production Jaguar saloon to feature the company’s tried and tested 5.0-litre supercharged V8.